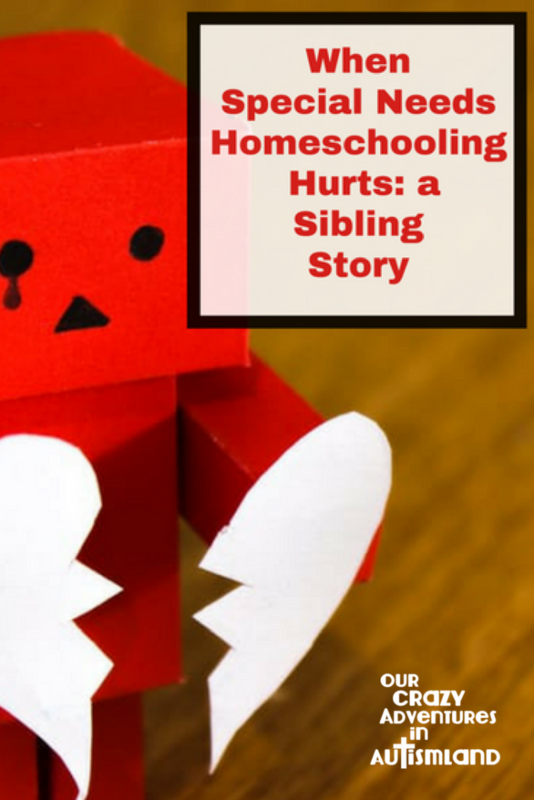 And that’s how our homeschooling journey changed. I now have one at a Montessori school and one in homeschool. Last fall began the roughest 3-4 months we’ve had in a long time. My older son’s anxiety kept increasing and increasing. He seemed to develop misophonia, a condition related to anxiety in which a person cannot handle certain sounds, sometimes to the point of physical aggression. So, in addition to shutting down and not talking because of his anxiety, his brother became a trigger. My boys are opposites in many ways. My Aspie prefers quiet for the most part. He’s not one for singing. My younger son, on the other hand, is a mover and a shaker…a hummer…a drummer and a tapper…he needs movement, he needs humming. When you have this combination in a two-bedroom apartment, life can be tricky for any parent. Add in anxiety and little brother being a trigger, and well, we got to the point where neither of my boys could be themselves. I can’t even express the pain all three of us lived in day to day and then my husband when he’d come home. I started asking people to take my son off for play dates so he could have a break from being yelled at. The stress level immediately decreased to almost zero as soon as he left. But how can you live like that, with each child feeling assaulted sensorily or verbally? My younger son became overwhelmed and sullen. Depressed, even. He couldn’t focus on school work. His life stunk. She replied, “Just because you can be grateful doesn’t mean it isn’t hard.” And boy, is she right. But that’s another day, another article. And so, we come back to “What about a Montessori school?” And that is where my younger son is today. I was both excited for him at the prospect and nervous. He’d never been in an institutional school. I knew he’d love the special classes like music and gym, I knew he’d like making friends. Had I taught him enough? It’s been a challenging transition for him. Socializing–no problem. He had friends right away, thanks in part to a great teacher. It’s the workload that’s the tough adjustment. The first seven days were rough and I wondered if this would work. Then I met with his teacher to get clarity on expectations. And she said he needed to remember he’s learning a new system and time management. So I was able to encourage him with her there, and I hope it helped. This week his spirits improved, though it’s still a lot of work for him. We’ll see how it goes. If nothing else, finishing the school year at the Montessori will give us time to get his brother’s anxiety under control, Lord willing. I know this isn’t the most eloquent storytelling out there. My hope is that by reading my story, those of you struggling with your doubts, your fears, your daily survival, will know that you’re not alone. There is someone else out there who has cried out for her children, who has lived in survival mode much longer than she’d care to, who can’t handle much of anything else. Remind yourself, as I do…God is Bigger and he loves your child more than you do. May you see this article as a cyber hug from me to you. If you’re looking for other special needs moms who “get it”, I invite you to join Special Needs Moms Network on Facebook. You’ll find thousands of women there and lots of support! What challenge are YOU facing these days? Tell me in the comments below. Thank you!!!!!!! I’ve homeschooled my older children for 10 years now. We LOVE homeschooling! We were a quiet, soft spoken, laid back family for years. Then, 4 years ago, we fostered and adopted our youngest child. He had extensive drug and alcohol exposure in the womb. We are still working on diagnosis but we now understand so much more about impulse control, what clinical hyperactivity really means, what a sensory seeker is, and why fatty acids are important! Lol. He’s 4 1/2 now and is THE MOST impulsive, gregarious, energetic, active, demanding child I’ve ever met! We adore him to pieces… but I’ve been on edge since the first week we brought him home. I’m fried! And my sweet older kids have been so patient and understanding with him (and me) but I don’t feel like we’ve really been able to hear them over the “baby” for the last 4 years. My youngest bio child is now 9yo and has PDD (mostly the sensory avoidant aspect and vestibular delays) so he very sweetly just tries to tolerate or dodge his little brother. My friend suggested we consider putting Miah in PreK. At first I balked. It felt like I would be rejecting him. Like I was deciding he wasn’t worth the effort. But my husband seconded the suggestion! Then my Mom. To be honest, I hated and loved it at the same time. The first morning, when the door shut behind my husband and our youngest, the kids and I all sat in silence for about 30 seconds with some sniffling… Then we all burst out laughing!!! It was weird! The calm was overwhelming. I actually cried but I think it was guilt over the relief I felt. We got school done, the house got clean, I went to the restroom without interruption! Yeah. I’m struggling emotionally with the decision… But your blog helped! ❤️ I’m not the only one. I feel weirdly rejected by school parents because we homeschool… But like a homeschooling failure because I actually felt EXCITED about having my youngest taught by someone else 5 days a week. I know that we need to do what works for all of our kids and for the family as a whole… and what I was doing before wasn’t working. I am so blessed by your words! Thank you for sharing. Doing what’s right for our kids is never easy.